You are currently browsing the category archive for the ‘coastal artisans’ category. Mark Saturday March 3rd on your calendars. Artists around Mobile and surrounding areas are getting ready for the first of four outdoor art market days that will take place in Downtown Mobile. We have a growing list of participants including painters, printmakers, folk artists, potters, jewelers, glass artists, sculptors, and more. In these days of rising costs of materials, operation, gasoline, travel, and show fees, artists are having to rethink how they do business. Most artists I know have had to face the reality of being more selective and discerning about what art shows they do. Travelling 800+ miles to do a show, paying an exhorbitant show fee (cuz the organizers are getting greedy – $1200 for one outdoor show in Michigan which is preposterous! ), with no guarantee that you will even make expenses is just not feasable. Some people I know who still travel away for shows try and be smarter by clustering their show bookings, but even then, one person I spoke to last summer, who did 3 shows on one trip, said his gas alone was at least $800. In an attempt to be creative and get something going in our area for artists (which hopefully for some will mean less travel), our group The Coastal Artisans (a collective of 13 artists formed last year) in conjunction with the Museum of Mobile (the history museum) , are presently working on putting together an art market (official name yet to be announced) right in downtown Mobile, across from The Gulf Coast Exploreum Science Center and the Museum of Mobile on the SW corners of Royal and Government Streets in the green space where the old city hall used to stand. Our mission is to benefit art, culture, and tourism in the city of Mobile and surrounding area, while at the same time providing self-representing working artists with a quality local event where they can show and sell their work. 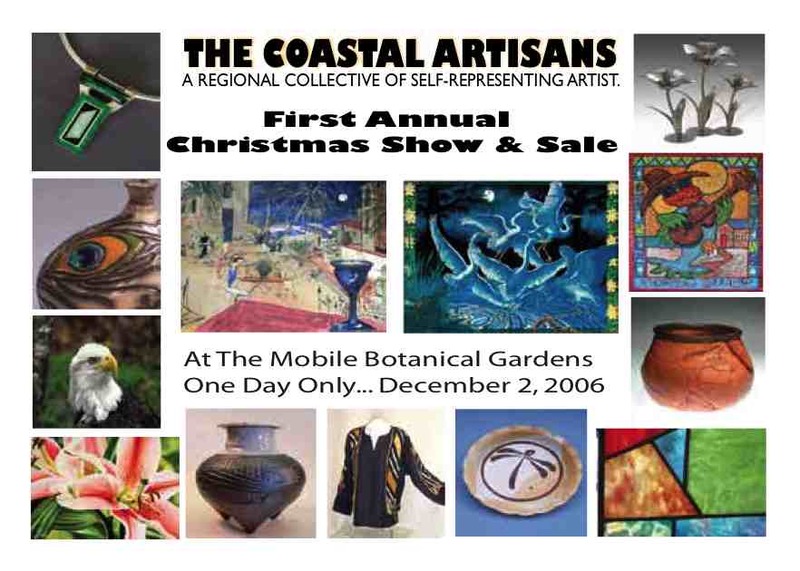 Like the Coastal Artisan show at the Botanical Gardens in December, the market will have an eclectic mix of invited artists presenting in a range of mediums. It will run the 1st Saturdays of March through June. 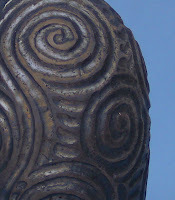 I should have more info soon on the Coastal Artisan blog/website. Well Christmas is right around the corner and December seems to have passed as soon as it came. There were a lot of pots made in between illnesses and the different obligations and distractions that typically pull you away when you have 2 small children. 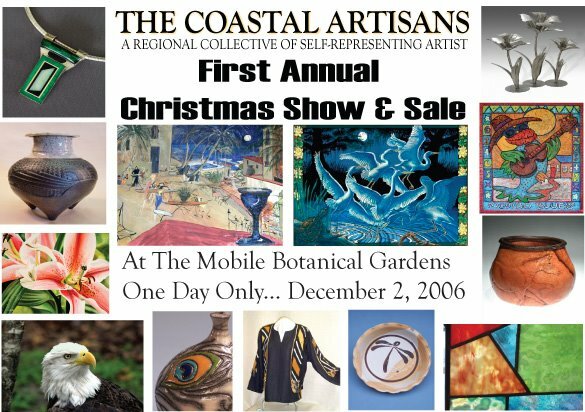 Our much anticipated Coastal Artisans Art Show took place on December 2nd (the invitational art show that we had been busily organizing since early last spring) and I am so very pleased to say it was a great success, thanks to a lot of elbow grease on everybody’s part, great community support, and, of course, a buying public. It was a very positive experience and imminently rewarding. We have a really personable and eclectic group of artists and I feel very fortunate to have been able to get to know them over the last several months. I really look forward to working with them again next year. In case you who were involved are reading this blog, I wish to thank all of you who participated and to everyone else who so generously helped us make everything happen. One of the members and a co-founder of The Coastal Artisans, is Charles Smith. A native of Mobile, Alabama, he is one of the region’s most well known, widely recognized, and certainly respected professional visual artists. He is a true craftsman with a shrewd business sense, a great sense of humor and a heart of gold. Some of you may be interested to learn that a number of video interviews with Charles have been posted on YouTube, where Charles reflects upon technique, design, and artistry, among other things. To view these eight videos, including a slideshow of some of his pots, go to http://www.youtube.com/profile?user=smithpots. Something else that has gone on in the early part of the month, as mentioned in my previous posts…… On Saturday Dec 16th, the Gulf Coast Kiln Walk Society had the official opening of their anagama kiln. Sadly we weren’t able to make it over be there for the event, but not for lack of desire (my 4 year old brought home yet another cold from school and this time, everybody here got it.). According to a recent email from Marty and Brenda Stokes, the firing took 5 days, as it did last year when Brian Harper helped them fire it. I can’t wait to see the pictures and, with any luck, a video of the event on their web site. My apologies to those of you who may have tried to access our web site for the last week only to get a “page not found” message. I can assure you, we have not fallen off the planet and, I’m happy to say, we are still most definitely very much here. As I had mentioned in a previous post, we, along with 11 other artists, have formed a group called the Coastal Artisans, a self-representing collective of noteable and established artists from the Mobile, Baldwin County, and Surrounding areas. Our mission is to present a broad range and eclectic mix of quality artwork to the public, and increase art awareness in the community. 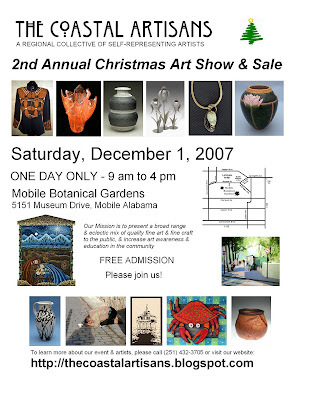 Our artists include: Charles Smith, pottery; Chris Hartsfield, Watercolors; Kurt Thomas, Serigraphs, Screenprinting; Phillip & Jaclyn Benedict, Fine Jewelry & Handcut Gemstones, Rick Tino, Acrylic, Watercolor, & Gouache; “Spike” Cloninger, Fine Lathe-Turned Vessels; Lowell Webb, Pottery; David Atwood, Stained & Fused Glass; Anne Webb, Pottery; William Colburn, Metal Sculpture; Scott Blackwell (Mombo Designs), Cajun Art & Design; Lillie Mack & Marilyn Gordon (Blackbelt Designs), Fiber, Fashion Design; and Jimmy Stroud, Nature Photography. On December 2nd, we are happy to announce that we will be holding our First Annual Christmas Show and Sale at The Mobile Botanical Gardens from 9 am to 5 pm. Its a one day only event and is being held in conjunction with the Master Gardeners’ and Annual Poinsettia Sale events at the Botanical Gardens. To find out more info about our group, our artists, and our Christmas Sale, please check out The Coastal Artisans’ blog/website (http://thecoastalartisans.blogspot.com) . We will be adding more info in the months leading up to the show.